In the granny squares class you will learn how to make a slip knot, slip stitch, chain stitch and treble crochet stitches, and how to work into a ring. 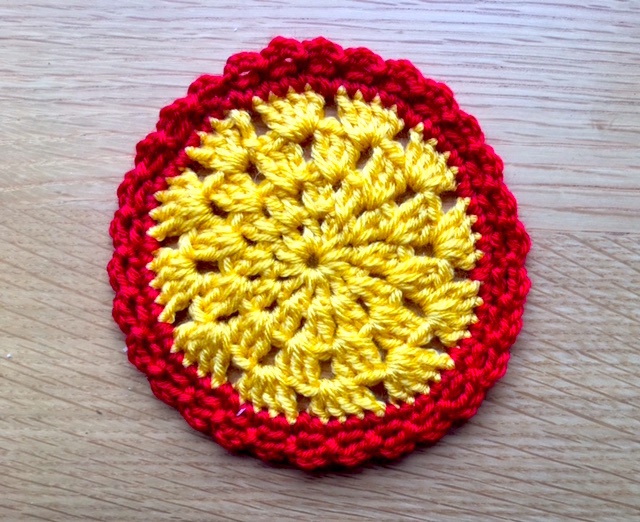 In the class you will be provided with various coloured yarn to make one complete granny square, and an instruction leaflet to take away, plus advice on choosing yarn for your own project. You can bring your own hook with you (we will be using size 4mm or 4.5mm which is suitable for the DK or Aran-weight yarn we will be using) or you can borrow one for the lesson. You’ll learn how to read a pattern and will get printed instructions to take away with you. 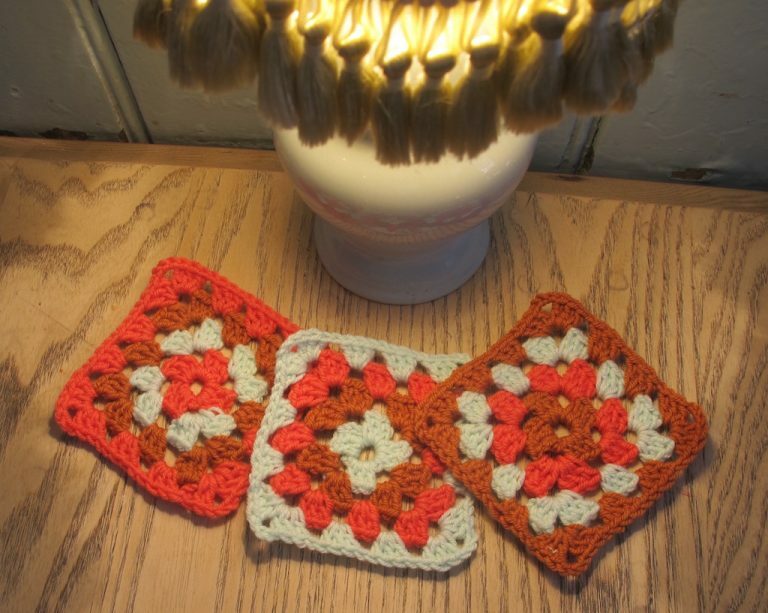 The traditional granny square is so versatile. 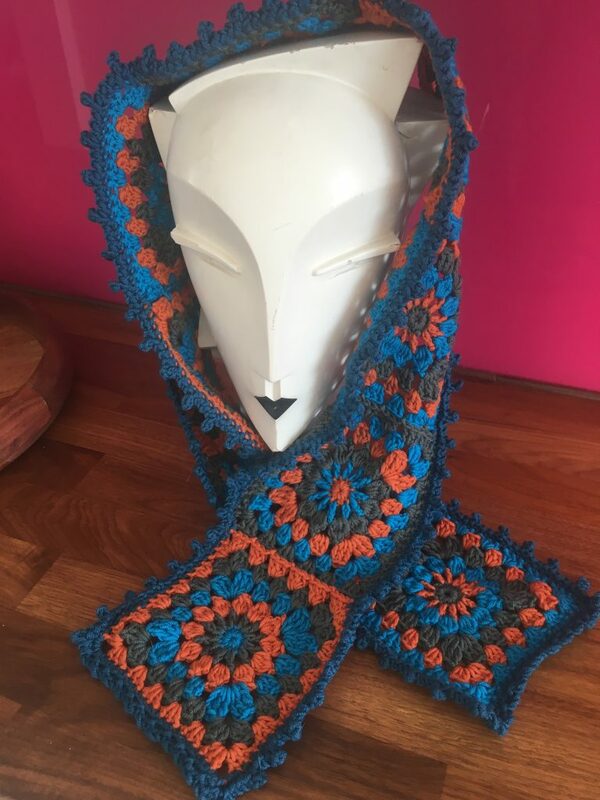 Once you know how to crochet one, you’ll be well on your way to making a blanket, a cushion cover, a table mat, a coaster, a wristband – the crochet world’s your oyster. You can read about some of the things I’ve made out of granny squares recently over on my Blog page. If you can already crochet the basic granny square, this hour-long class will teach you some variations. I’ll also have lots of examples for you to look at and will take you through how to complete any you particularly like the look of. I’ll be providing yarn for you to try out the techniques at the class, or you can bring your own with you. Bring your own hook (size 3.5mm or 4mm) or you can borrow one for the class. 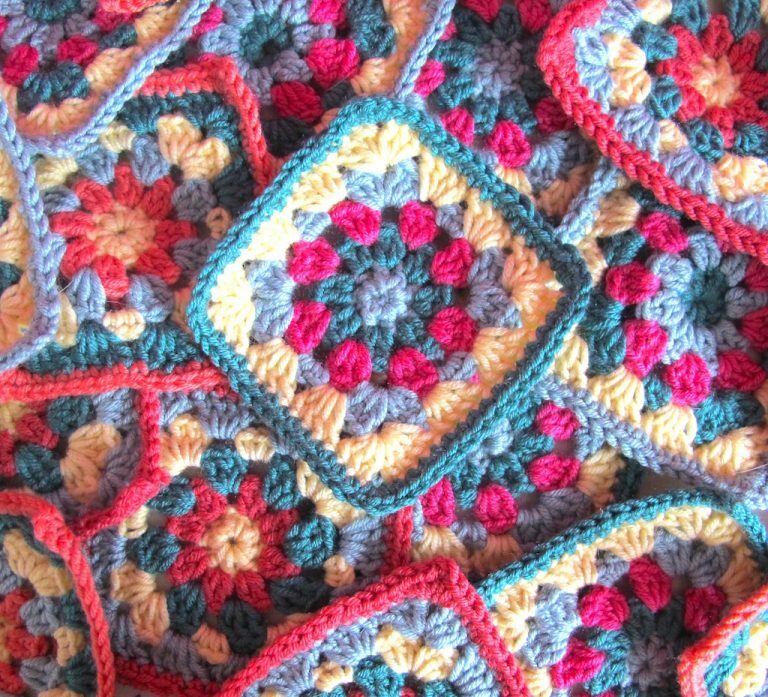 If you have crocheted some basic granny squares, this hour-long class will teach you some fancy ways to join them together (as well as some of the basic methods too!). 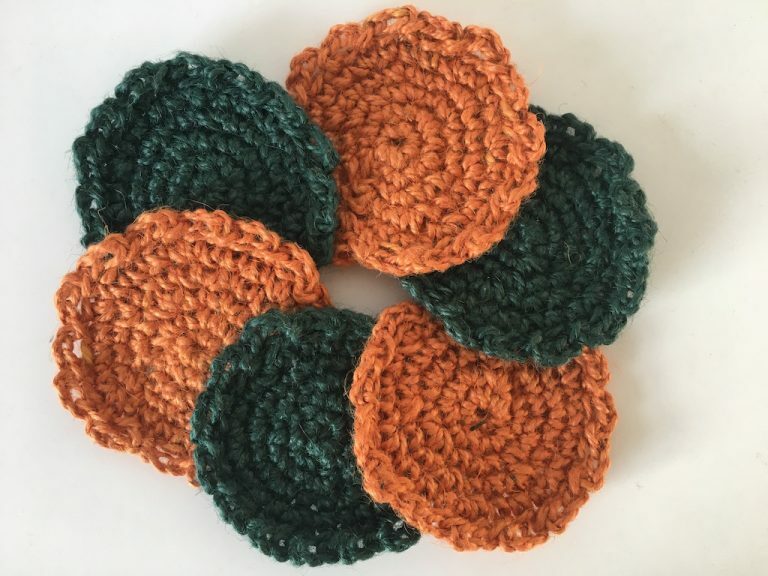 For this class you will need to bring along at least 4 completed three-round basic squares and the yarn with which you want to join them together and the size of crochet hook you are using for your individual project. 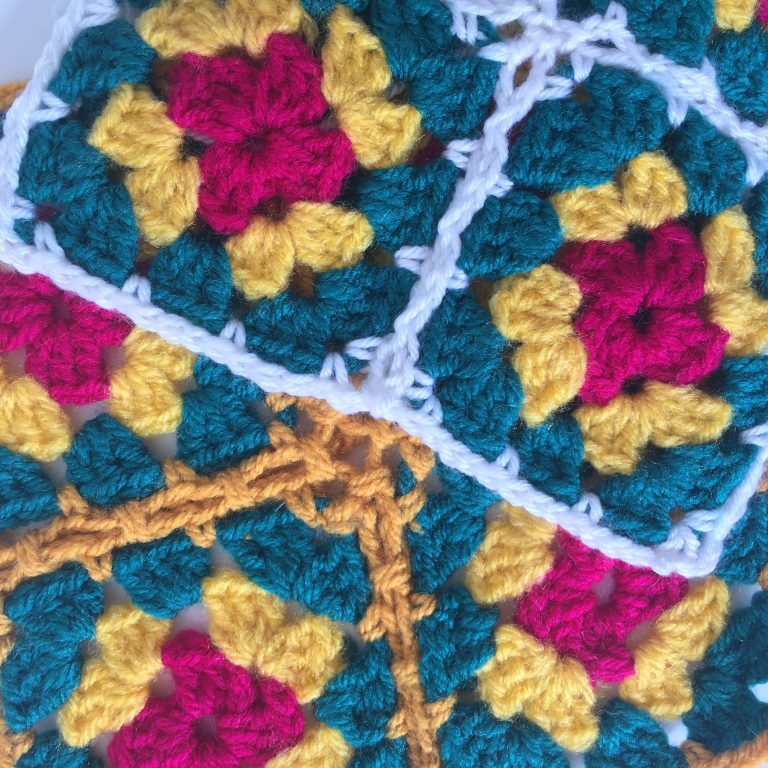 If you know how to crochet a basic granny square, why not expand your crochet knowledge to make these advanced squares which you’ll learn how to join-as-you-go, as well as new stitches like treble clusters and picot edging. To make the scarf you’ll need four 50g balls of DK yarn – one in each of four colours – plus a 4mm crochet hook. At the lesson you’ll learn all the techniques required and how to read the pattern, which you’ll take away with you so that you can complete your scarf at home. There will be spare yarn to use in the lesson and hooks to borrow, but if you’d like to start your scarf during the lesson, make sure you buy your yarn beforehand. This scarf uses Sublime Extra Fine Merino DK. This beautiful Xmas wreath is a suitable project for anyone who has learnt a couple of crochet stitches already. 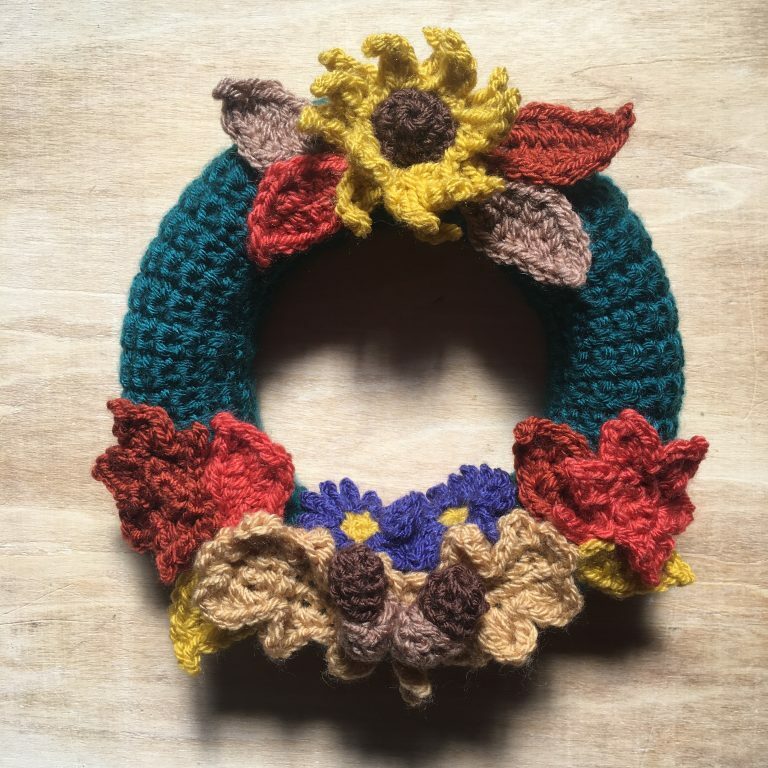 As long as you can use a crochet hook and know at least two or three of the following, you’ll be able to make this wreath: chain stitch, slip stitch, double crochet, half treble, treble. The little flowers can also be made separately and used as Christmas decorations by themselves, or even brooches. During the class you’ll learn all the techniques needed to make all the individual parts at home yourself, and you’ll get an instruction leaflet, which I’ll make sure you can follow during the lesson. 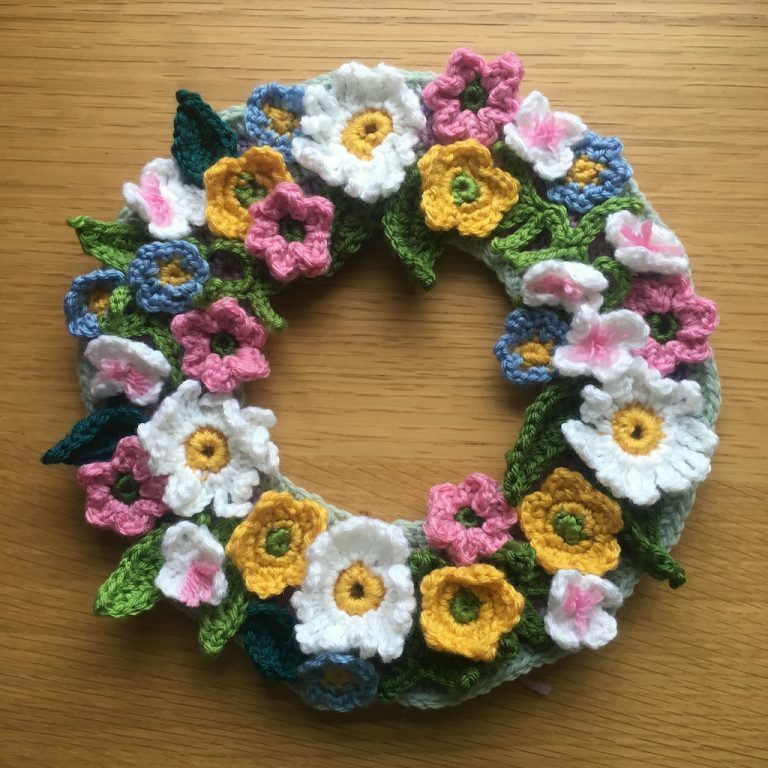 I will have some kits available to buy if you’d like to start the actual wreath in the lesson. 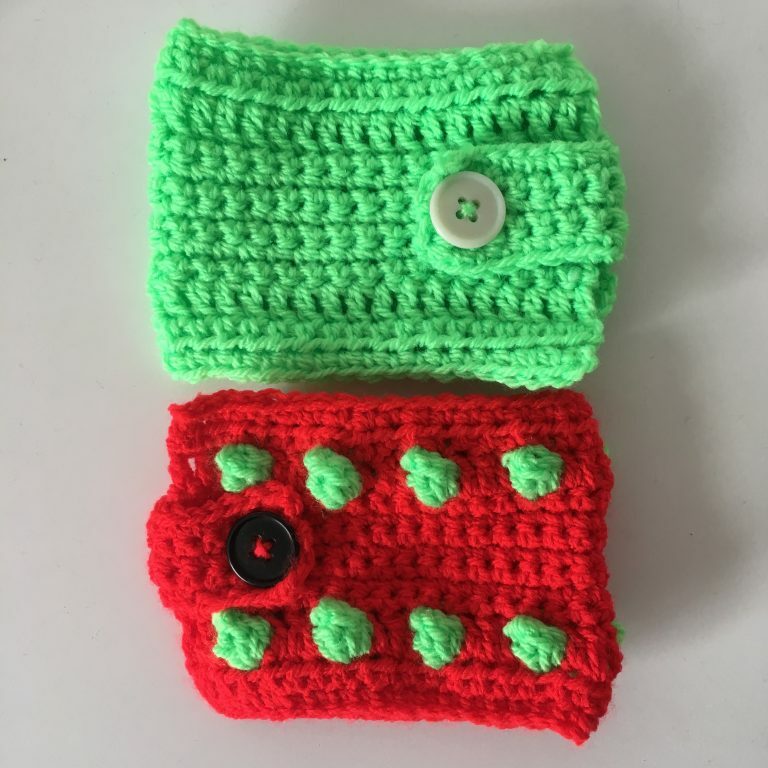 If you have learnt how to do at least one of the basic stitches (eg double crochet or treble), this class will teach you a number of other stitches – the project uses chain stitches, double crochet, half treble, treble and popcorn stitches, plus how to make a button hole, and how to work in two different colours. If you are a beginner, you will learn a simplified version without the bobbles, which just uses chain stitch, double crochet and half trebles. During the class you will learn and practice all the techniques you will need, and will be taught how to read the pattern. 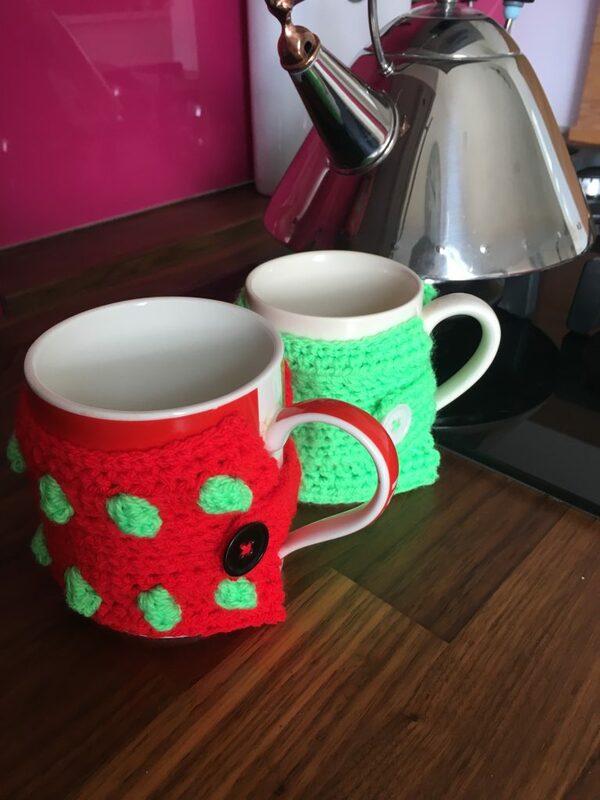 You can then finish the mug cosy at home! There will be hooks to borrow at the lesson and spare yarn to practice the techniques. If you want to start your own cosy in the class, you will need a 4mm hook and Double Knitting wool in two colours. Just a small amount of the contrast colour and about 15-20g of the main colour, plus a button. 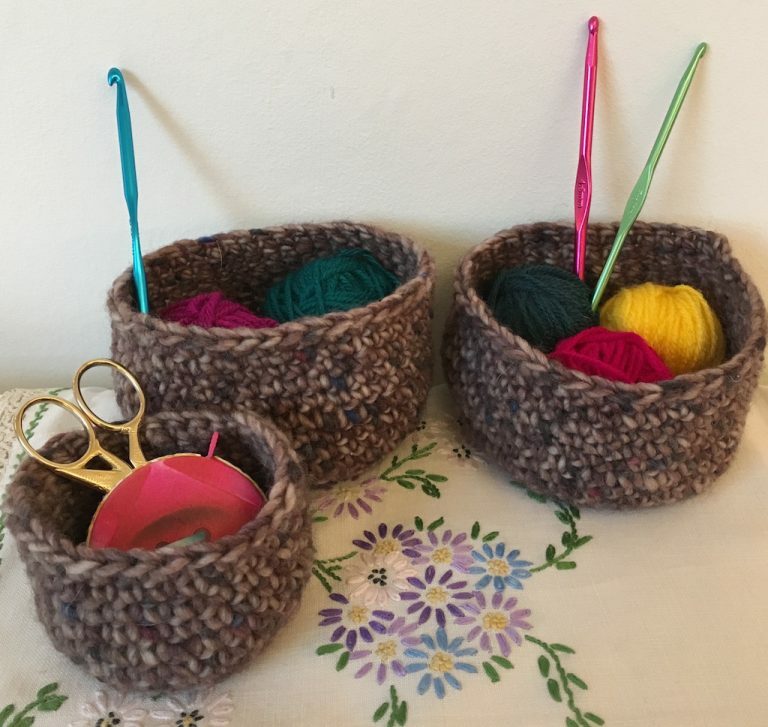 Little baskets are simple to work, even for beginners. 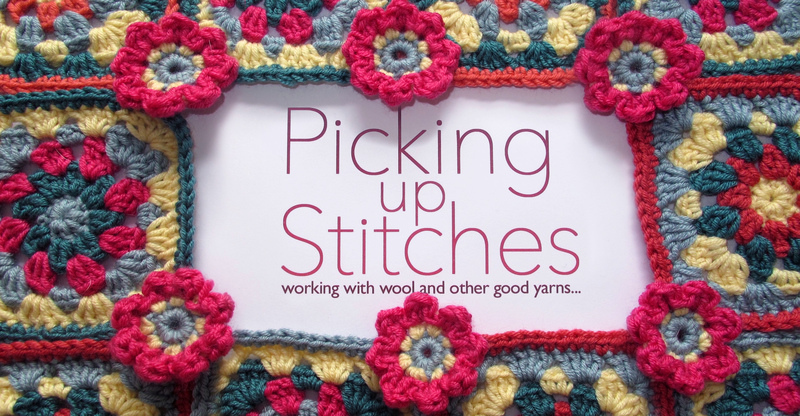 You’ll learn how to work in the round, and use double crochet and half treble stitches. There’ll be spare yarn for you to practice the technique in the class and there’ll be hooks to borrow. The yarn choice can produce lovely variations in size and shape. If you get in touch, I can advise on what to buy if you wish to do that so you can start your own basket at the class. 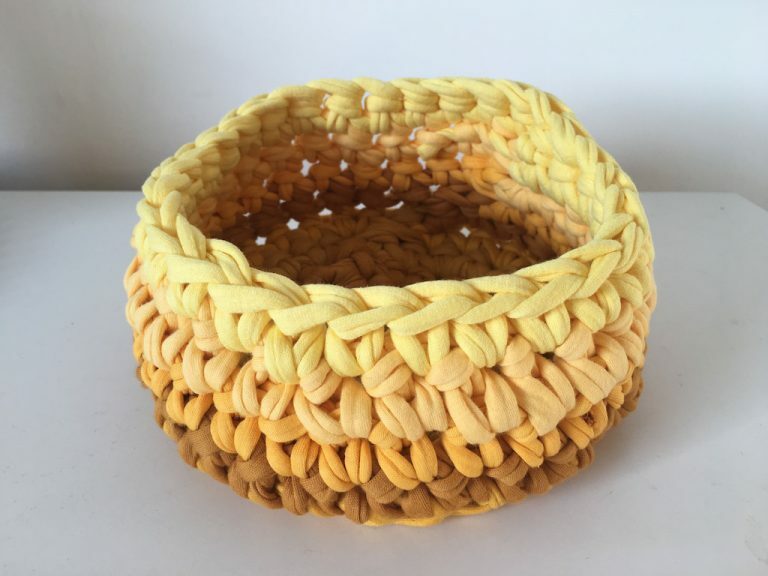 You can see some of the baskets I’ve made on my blog here. These are suitable for beginners and once you’ve mastered the technique you’ll be able to make table mats to match too. Yarn will be provided for one in the lesson, however if you want to make a set and buy your own yarn to bring along, I can advise you on yarn and hook selection before the class. You’ll learn how to read a pattern and will get printed instructions to take away with you. Perfect if you like using your mobile phone while you’re out and about. 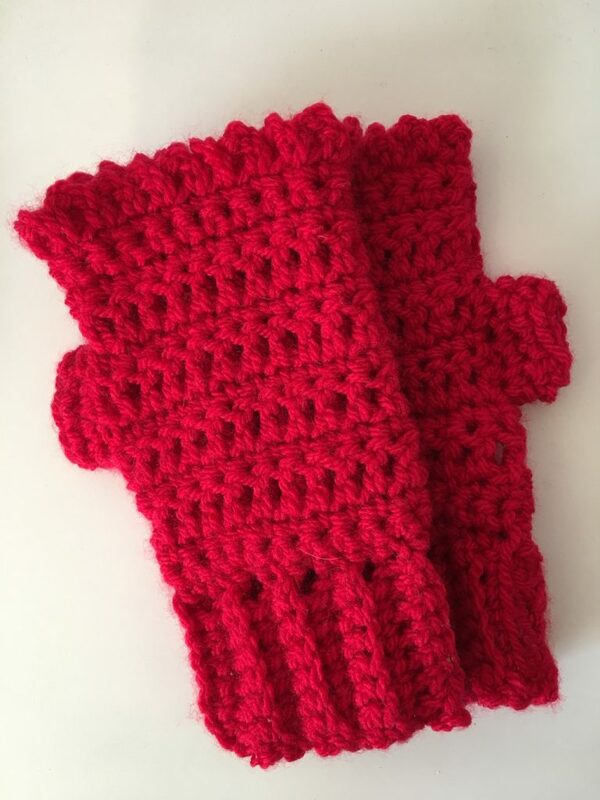 These gloves are a great project for beginners. You’ll learn how to make a slip knot, chain stitches, double crochet and treble, how to work in rows. You will learn all the techniques needed to complete the gloves which you will do at home. I am always on hand to help via email after a class. They are made in Aran weight yarn with a size 5mm crochet hook. If you want to buy your own yarn in advance, the whole project takes about 50g (often balls come in 50g, but check the label). If you need further advice on this before the lesson, do get in touch. I will also have some yarn you can buy at the class if you wish, so that you can start your own gloves on the day even if you’ve not brought your own. Or you can use the spare yarn I’ll have with me to practice all the techniques you’ll need. There will be crochet hooks to borrow for the class if you do not have your own. 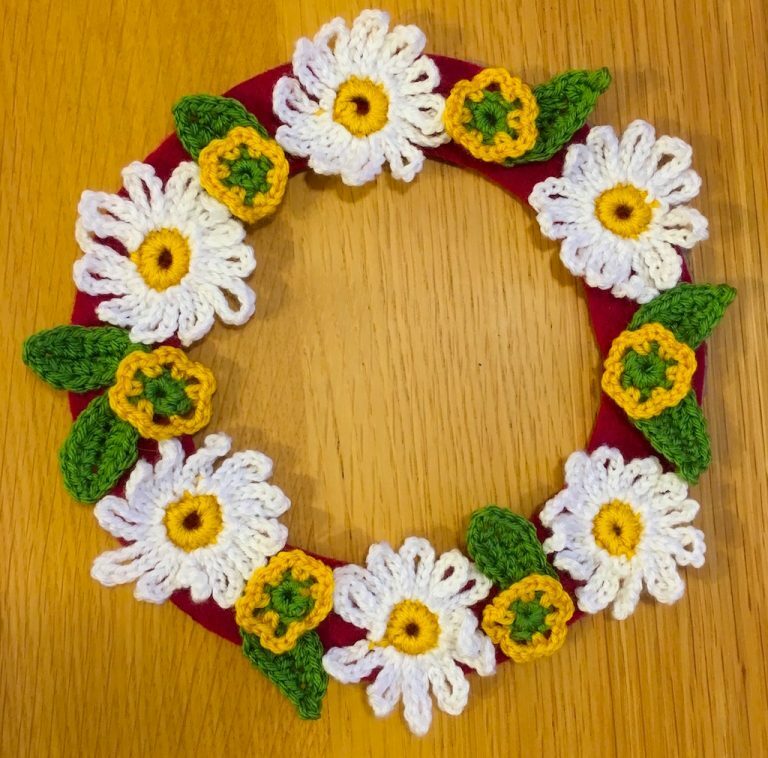 This gorgeous seasonal circular floral decoration is suitable for those who know how to hold a hook and yarn and make the basic stitches (chain, double crochet and treble). However no great experience is required. And if you are a complete beginner, there’s a simplified version that’s suitable for you too – see below! You’ll learn how to make a variety of little flower motifs, using a combination of simple stitches. Plus you’ll learn how to work in the round to create the base, and how to fit it all together. 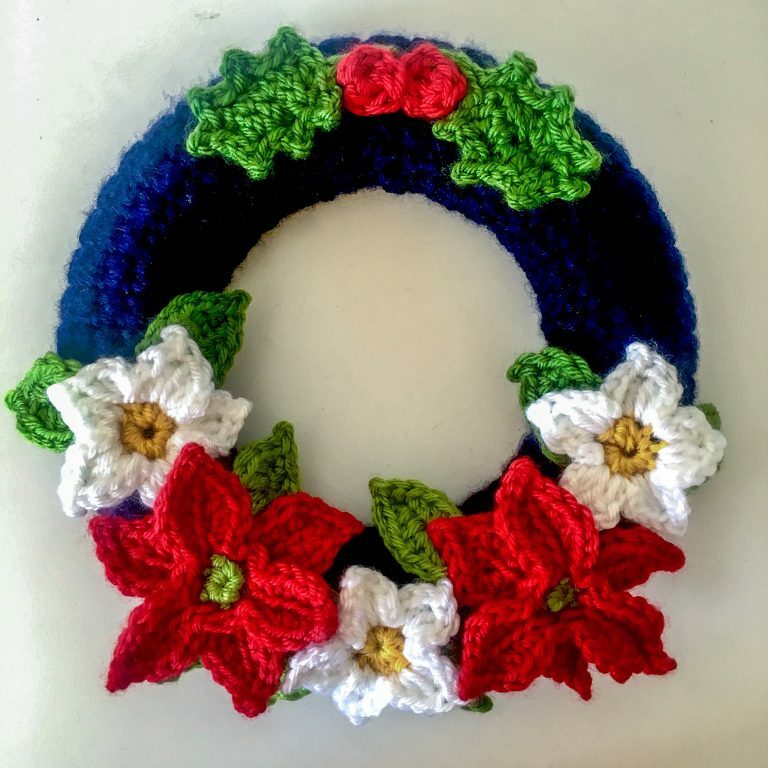 You won’t have time to complete the wreath in the class but will learn how to make all the components so that you can complete it in your own time at home. This wreath can be made in any yarn however, here and on the pattern leaflet I will supply, it is completed in Double Knitting (DK) weight yarn. Some of this will be provided for you to practice all the techniques in the lesson and there are hooks to borrow too! You’ll learn how to read the pattern and will get printed instructions to take away with you. You’ll learn basic crochet stitches, and how to work the daisy and buttercup flowers and simple leaves. These flower motifs can be used in many different ways. You’ll be given written instructions for how to make them into this simple floral wreath, which has a felt ring base. There will be hooks to borrow for use at the class and I’ll supply amounts of yarn so that you can try out the floral motifs. You could instead choose to combine flowers and leaves to make an applique motif to sew onto a bag or anything else you’d like. You could even make a little bracelet or a brooch. By the end of the class, you will have been taught how to read the pattern, which will be provided. In this project you will learn how to make a slip knot, slip stitches, chain stitches, double crochet and treble stitches and how to work in a flat circle. The mat is really versatile and can be made in any yarn to produce different effects. You will be provided with yarn to complete a small mat at the class and there’ll be hooks to borrow. You’ll learn how to read a pattern and will get printed instructions to take away with you. There is also a square mat you can choose to make instead. 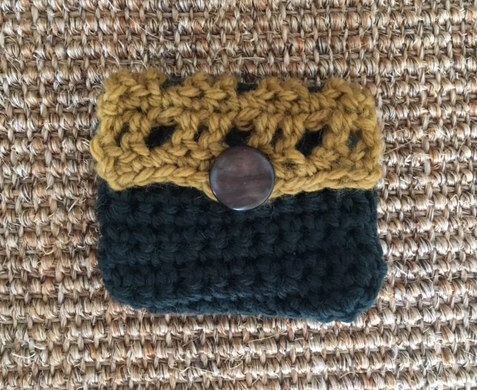 This useful little purse is suitable for complete beginners. You’ll learn how to make a slip knot, slip stitches, double crochet and treble stitches, and how to work in rows. All the materials to make a little purse will be provided at the lesson and there’ll be hooks to borrow too. You’ll learn how to read a pattern and will get printed instructions to take away with you, so that you can finish your purse at home.